Either the CR720 or CR720XL I/O Module is required in each CR7 System. The CR720XL provides regulated power for analog and digital functions, 16-bit A/D-D/A conversion (analog interface card), and a precision voltage reference. The CR720XL includes an I/O chassis and contains slots for up to fourteen I/O Cards. Note: We offer a number of components to add to existing CR7 systems; however, the components necessary for thermocouple psychrometry applications are no longer available. The CR720XL is an I/O module and analog interface for the CR7 Modular Measurement and Control Datalogger; either the CR720XL or CR720 is required in each CR7. The CR720XL provides regulated power for analog and digital functions, 16-bit A/D-D/A conversion (analog interface card), and a precision voltage reference. This module includes an I/O chassis that contains slots for up to 14 I/O cards. 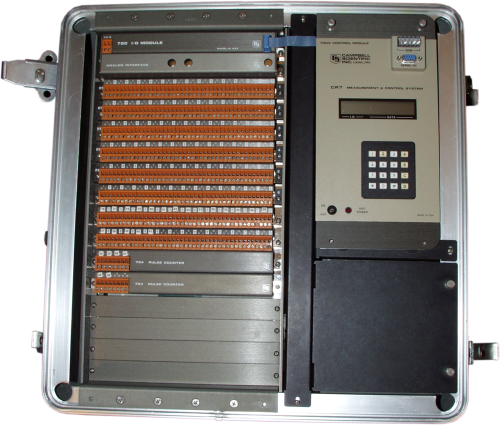 Field use requires an ENC7XL enclosure. -NOTE- Note: Specifications are listed in the CR7 Specifications Sheet.